Villagers in the remote South Lakeland community of Kentmere have been brought bang up to date with the arrival of high-speed fibre broadband in their valley. 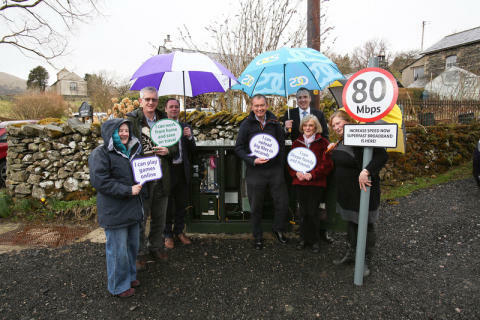 Around 54 homes and businesses in the village can now get superfast speeds up to 80Mbps following investment by the Connecting Cumbria partnership between Cumbria County Council and BT. It’s a major step forward for a community which doesn’t yet have mobile phone coverage and, previously, could only get broadband capable of 2Mbps or less. The Connecting Cumbria programme has now installed more than 700 fibre broadband structures in the county, giving more than 126,000 Cumbrian homes and businesses access to the high-speed technology. Tim Farron, MP for South Lakeland, who officially unveiled the new fibre broadband cabinet in Kentmere, welcomed the “big boost” to the local community. He said: “Access to high-speed broadband is a massive issue here in the South Lakes with many small businesses finding it pretty much impossible to function without it. Peter Lansberry, chair of the Kentmere parish meeting, highlighted the difference that the high-speed fibre broadband is going to make to everyone’s lives. He said: “Kentmere is a remote valley, well up in the mountains. We have no mobile phone and prior to the fibre we had broadband speeds of between one and two megabits per second …some people with less than even one megabit. “These speeds make it nearly impossible to do online shopping and doing business is very difficult. There is no ability to watch catch-up TV or anything on the web. To reach the remote community, Openreach engineers had to overcome a variety of challenges including the need to drill into the tough limestone rock to install 30 new telegraph poles. Matthew Fishwick, senior project manager for Openreach, said: “We’ve put about 30 new poles up in the area and that was quite a difficult solution because the rock around here is so extreme and each pole needs to be drilled in. In order to ensure the minimum of inconvenience when running cables across people’s land, we’ve worked very closely with local land-owners, including the farmers in the area. David Southward, Cumbria County Council’s Cabinet member responsible for economic development, added: “Connecting Cumbria is working hard to get out to more and more rural parts of Cumbria. It’s great to see us getting into places like Kentmere, which is in a long glacial valley - a dead-end - but a community that really needs superfast broadband. Connecting Cumbria is working hard to provide the best connectivity possible for areas not currently featured in the roll-out plans within the funding available..
Press contact:Please contact the Regional Press Office on 0800 085 0660. Since October 2013, the Connecting Cumbria project – a partnership between Cumbria County Council and BT - has enabled more than 700 fibre structures, with more being switched on every day. More than 126,000 households and businesses can now access fibre as a result of the project.